Sometimes opportunities presents themselves out of the blue. 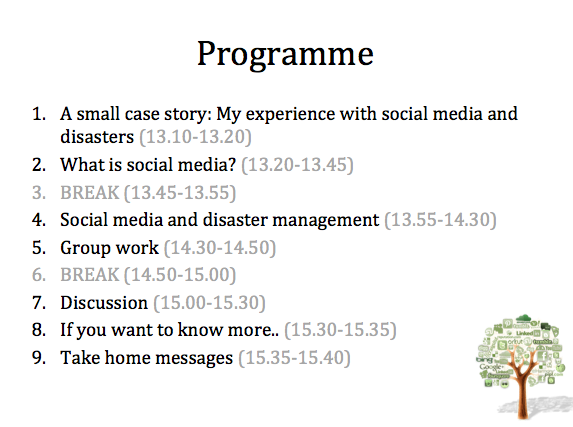 When I was asked to give a lecture on social media in emergency settings at the Master of Disaster Management at University of Copenhagen, I didn’t quite feel like an expert on the topic (as I wrote about in an earlier post). But it did not take much research to realised that the combination of social media and disaster/emergency management is super interesting and an example of how social media can play a role in saving lives. It doesn’t get much more public health relevant than that. Both preparing for the lecture and teaching was a good experience, and I feel I managed in the 3×45 minutes available to get around the topic in a comprehensive way – although with that time frame it can only be an introduction. In addition, I got great feedback from the students who, coming from all over the world, had different experiences with dealing with disasters, which they could contribute with in the discussions. In my experience the first (and sometimes only) thing that comes people’s mind when they think of what social media can be used for in emergency settings is dissemination of information and messages to the public. Social media are simply categorized as yet another communication channel equal to radio, tv etc. But as it is well illustrated in the YouTube video on the right (click the picture) it is much more than that. With this experience it was important for me in my lecture to highlight some of the other key functions of social media in disasters. Below are 4 broad categories for the potential use of social media in emergency situations. There are surely other ways social media can be used and as said the four below are quite broad and thus covers lots of sub-functions. Communicate and enter into dialogue with the public, other institutions etc. Gather information about the emergency by monitoring the situation, identifying areas of need and picking up rumours and misunderstandings. One advantage of teaching (and of blogging) is that you get so much feedback and suggestions for new things to read, websites to visit etc. I thought I’d share two of these tips with you. The first is a website that a student in the class recommended. It is called Safe & Well and is provided by the American Red Cross. The idea is that after a disaster, people in the affected area can through this website let their family and friends know that they are safe and well. By clicking the button “List Myself as Safe and Well” you register on the site. Relatives can then search the list of those who have registered themselves as “safe and well” by clicking on the “Search Registrants” button. The results of a successful search will display a loved one’s first name, last name and a brief message. 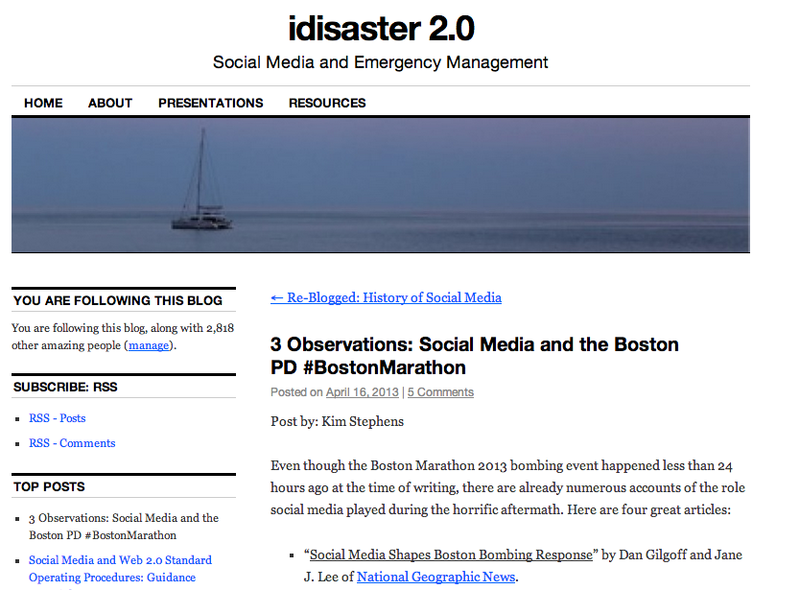 The posts on this blog are double-posted on the Medical Museion’s website and there my previous post on social media and disaster management was commented by a researcher from Aarhus University, Andreas Birkbak, who had authored an interesting article about the use of Facebook for informal emergency collaboration during a snow blizzard on the Island of Bornholm in Denmark. A very interesting article that I might use next time I teach. Read the article your self: Crystallizations in the Blizzard: Contrasting Informal Emergency Collaboration In Facebook Group. Thanks for sharing it on the blog, Andreas! Social media is there in the world and will be used in disaster situations whether you like it or not – you can’t afford to disregard it! Social media can (and should) be used for much more than dissemination – take advantage of its possibilities to monitor and get into dialogue! When working with disaster management don’t hold back from social media because you’re afraid of making mistakes, because you will make mistakes – just make sure you learn from them!